Family owned and operated since 1958; Luigi's is a Colorado Springs Tradition! Casual, cozy, family dining. Tired of 'chain' dining chaos? Tired of bars that 'serve food?' Luigi's is what you have been searching for! Full Dinner menu including Homemade Manicotti, Ravioli, Tortellacci, Lasagna; Chicken Marsala, Chicken Parmigiana, Chicken Cacciatore, homemade sauces and pastas, pizzas and nightly specials. We also offer a children's	menu. 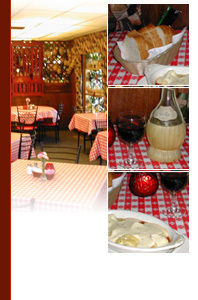 All entrees include salad or soup and fresh Italian bread. Everything on our regular menu is available for carry out. Call Ahead to put your name on the wait list: 719-632-7339. Luigis now available for Private Dining and Private Luncheons. Read what customers are saying about us – Click Here.